The Botanist's Repository 5 (1803b) t. 292. Geophyte 90-240 mm tall when in flower, tuber turnip-shaped or elongated, roots branched, occasionally stems branched as well. Juvenile leaves simple, later trifoliolate, pinnate or irregularly pinnate or bipinnatisect, green, petiolate. Laminae of simple leaves ovate, 20-50 x 8-20 mm; laminae of compound leaves elliptic in outline, 50-120 x 40-100 mm, pinnae ovate or linear to laciniate, 20-60 mm long, (1-)3-7 mm wide, apices acuminate, margins entire, adaxially glabrous, ciliate, abaxially hirsute with long stiff appressed hairs; petiole 25-50 mm long, rigid, erect, setose with appressed bristle-like hairs interspersed with short glandular hairs. 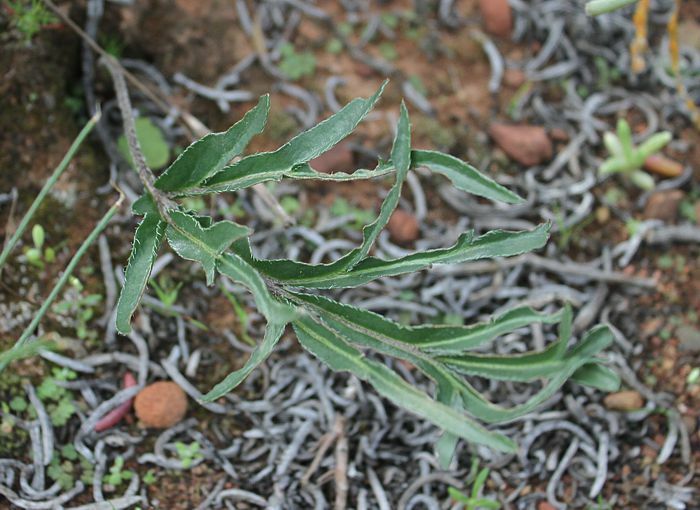 Stipules triangular or narrowly triangular, adnate to petioles for half their length. 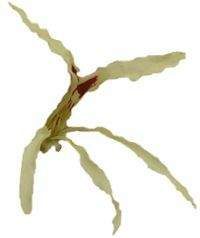 Scape, bearing 2-5 pseudo-umbellets, each 3-8(-13)-flowered. Pedicel cca. 1 mm. 5, lanceolate to triangular, apices acute, 5-8 x 1-4 mm, green to reddish brown with margins white. Hypanthium 6-12(-25) mm, densely covered with glandular hairs. 5, white, cream-coloured, yellow or pale pink, ligulate, margins undulate, claws forming a sheath, apices patent or recurved; posterior two with a wine-red stripe or blotch in the centre, bases cuneate, apices rounded or obtuse, 16-25 x 1.2-3 mm, length/width ratio 6-16, anterior three (often) with a wine-red stripe in the centre, bases attenuate, apices rounded or obtuse, 13-19 x 1-1.5 mm. 5 fertile, concealed in the floral sheath, posterior one cca. 2.5-4 mm, lateral two 3.5-4.5 mm, anterior two 4-5 mm. P. undulatum lives alongside P. violiflorum and P. luteolum just E of Worcester, and shares the leaf structure and indumentum with the former. This is an area of extraordinary interest to a succulent enthusiast, with Quaqua mammillaris and Haworthia pumila, as well as numerous species of Aloe, Eriospermum, Euphorbia, asclepiads and mesembs in abundance. 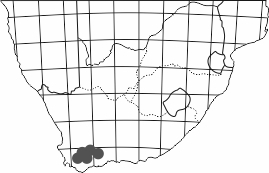 P. undulatum is found in small populations, in sandy soil or shale in low karooid vegetation, and flowers as early as August (January in N hemisphere). 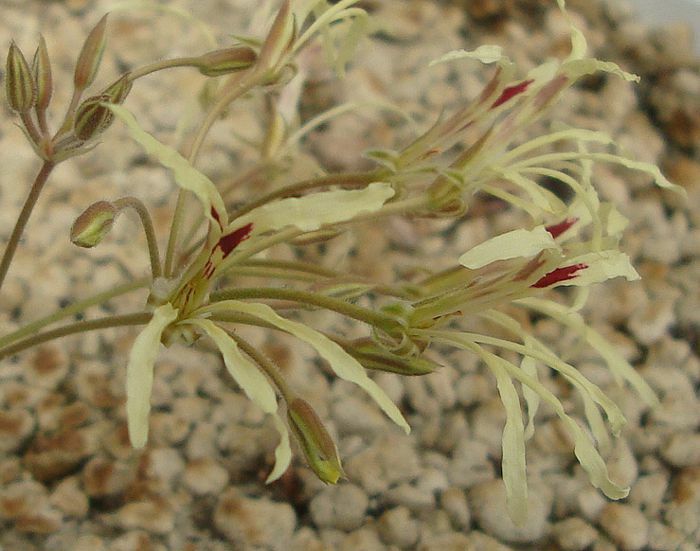 In the absence of leaves, it may be difficult to tell P. undulatum apart from P. longifolium: the petals of the former tend to be only slightly shorter and broader. The indumentum on hypanthia is different: those of P. undulatum are covered with glandular hairs, while P. longifolium has hypanthia with appressed curly hairs interspersed with long glandular hairs. 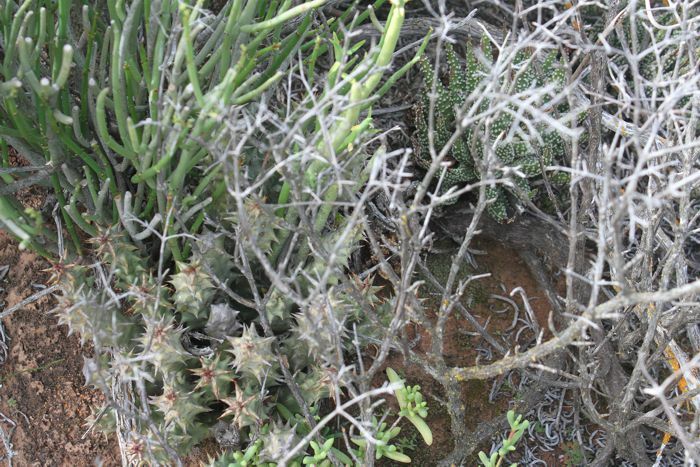 The peduncles of P. undulatum are covered with glandular hairs interspersed with very long soft patent hairs, while those of P. longifolium have the same indumentum as on hypanthia.